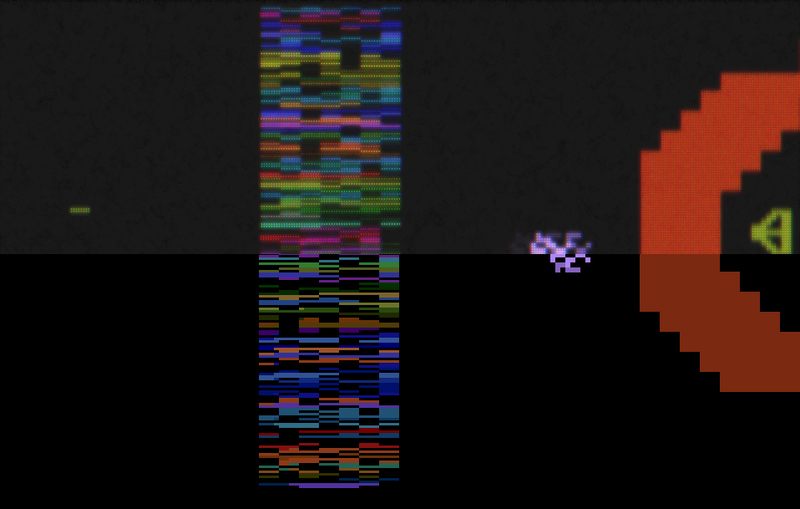 This is absolutely stunning: Ian Bogost had his computer science students at George Tech modify Stella, the opensource Atari 2600 emulator, to reproduce the same kind of visual artifacts you would’ve seen when you played the VCS on a CRT television (those big boxy TVs with tubes, for those of you who don’t remember). Their CRT Emulator will soon be a configurable option in Stella. Now we’ll finally be able to recapture the original experience of playing Yar’s Revenge on your parents’ 19″ Magnovox, minus the wood console. The crisp image in the bottom half is what we see when we play an Atari 2600 game on Stella now. The top image is what we would have seen playing in the late seventies on a television — and what we’ll soon be able to experience with Stella (Click the image for a larger version). And here’s a question I’ll be asking my videogame students today: why would degrading the graphics on a game actually be a good thing? Here’s the chance of a lifetime, the opportunity we’ve all been dying for: playing a victim in a mock terrorist attack. And this isn’t just any simulated terrorist attack. This is a terrorist attack on a baseball team! The Reds, no less! On Saturday, September 30 the Department of Homeland Security and the Southwestern Ohio, Southeastern Indiana, and Northern Kentucky (SOSINK) Regional Collaborative will conduct a full scale simulated terrorist attack training exercise at Great American Ball Park. I know what a full-scale terrorist attack is. But what’s a full-scale simulation? Do we have to pretend to be afraid? Or can the fear be real, but the threat fake? Or can the threat be real and the fear be fake? Hmmm, maybe the press release explains these nuances? The Reds are asking for volunteers to come to Great American Ball Park to act as fans to be evacuated after a simulated attack. In appreciation for your attendance the Reds will provide each participant with a voucher for two tickets to a future baseball game in the 2007 season as well as other promotional items. Omigod, omigod, omigod, am I reading this correctly? Can it be true? I can be a victim and a future attendee at a Reds baseball game? A voucher!? It’s a dream come true. But wait, what about my kids, can they come too? Volunteers do not need to pre-register. Families are welcome. YES! Well, then, I’m definitely bringing my family. It’s an outing! Family time, together! Mom and Dad and the kids! Popcorn, hotdogs! Smallpox, anthrax! What a day! But how long will this take? I hear real terrorist attacks can take days, you know, dragging on and on forever, like Texas. We ask all volunteers to arrive at Great American Ball Park between 7:00 a.m. to 8:00 a.m. Free parking will be provided at Great American Ball Park, The East Garage, and Parking lots B, C, and the Freedom Center parking lot. The volunteer fans should be finished by 10 a.m.
Whoa, free parking and I’m done by 10am? Sign me up! Oh, I forgot, there’s no need to pre-register! It’s a democratic simulation! Everyone’s invited! The more the merrier. Bring your friends! Bring your neighbors! Play dead! Play bloated disease-ravaged corpses! Play hostages! Play that one cool dude who’s ex-Special Forces and takes on the terrorists singlehandedly! It’s a simulation and anything goes! So yesterday my wife, son, and I ventured for the first time into Kids-R-Us, home of the well-behaved toddler, destination of choice for the stark raving mad parent. Our visit deserves a separate post of its own (suffice it to say that it ended with the purchase of 100 plastic balls, each the size of a grapefruit), but what really needs to be said is this: why does a child need a play ATM machine? Here you see an image (Larger Image) of what the proud parent ahead of me in the checkout line bought their little girl: the YOUniverse ATM toy, complete with a plastic ATM card, an alphanumeric keypad, a functioning screen, a slot that accepts bills, and Baby’s first PIN number. WTF? Seriously, a PIN number. It’s true that many toys are nothing but thinly disguised training tools, preparing our children for the drudgery of adult labor–play kitchens, play vacuums, play tools–but I think the play banking machine is a different beast altogether. The machine takes for granted an idea that I will go to my deathbed resisting: that our electronic lives–our database selves composed of PINs, account numbers, credit records, virtually every transaction of our day-to-day lives, stored and aggregated in corporate datawarehouses–are essentially our whole identity. Without that PIN, we’re nothing. Written over twenty years ago, this passage still seems fresh–if only we stop to think about it. Automatic Teller Machines have become such a part of our daily life that we forget. “Automatic” now describes us as much as it does the machines themselves. DeLillo continues, “the system was invisible, which made it all the more impressive, all the more disquieting to deal with.” I think Baby’s First ATM functions as an innoculation to the more disquieting, unsettling aspects of our second, database selves. It’s not a conscious effort by the banking industry, of course (I am not that conspiracy minded). Rather, I think it’s the absurd, logical extension of the reduction of our lives to sets of data owned by corporations. “The more we rehearse disaster, the safer we’ll be from the real thing…..There is no substitute for a planned simulation.” So says a character in Don DeLillo’s 1985 novel White Noise, as a midwestern town is overrun by men in Mylar suits, conducting a simulated evacuation from some vague chemical disaster. On Tuesday, August 9, 2005 McGuire Nuclear Plant, Mecklenburg County Homeland Security, and regional first responder agencies will conduct a full-scale facility exercise to test the plant’s response systems as well as local resources and their capabilities in the event of an emergency. So if you live in Huntersville you may see more activity around the plant than normal, no worries. We will share the results after the event debriefing, take care, and be safe. People have always been exposed to low levels of natural radiation. These levels provide a “background level” for comparison to exposures that occur from man-made sources. Basically, natural radiation is the result of cosmic rays from outer space and from radioactive materials in the earth. Man-made radiation comes from a variety of sources including medical and industrial uses, nuclear weapons testing, consumer products, and the nuclear power industry. This image informs me that natural background radiation is 300 times greater than the radiation released by a low-level nuclear waste storage facility. If that’s true, why is one of the lead stories in this morning newspapers the EPA’s announcement that the Yucca Mountain Facility in Nevada, where much of the nation’s nuclear waste is stored, should shield the outside world from radiation for 1,000,000 years? As most critics note, the one million years rule is a ruse to conceal the fact that the EPA is actually raising the allowable radiation limit for the first ten thousand years of those million years–the years that probably matter more to the Nevadan citizens living near Yucca Mountain.